Last week, I hoped on gChat to talk shop with author Briana Morgan. Briana is a thriller, crime, and horror writer and freelance editor. Her work includes the YA novels Blood and Water and Reflections, and the one-act play, Touch. After years of being in touch on social media, I was so excited to chat with Briana in real time about the writing life and exchange notes about our work. Katie Li: Hello! How are you, Briana? BM: I'm doing great! Just poking around in GIRLS' SCHOOL edits. How about you? KL: I'm doing well! Jumping into a messy first draft of a new series for NaNoWriMo. I kinda forgot how freeing--and also horrifying--it can be to start a rough draft. Are you using NaNo to edit? BM: I am! My first time ever doing a modified NaNo, so we'll see how it goes. KL: I appreciate you taking the time to talk! KL: So, we've been in touch via Twitter and Instagram for a while now, but I'm curious to know, how did you get started with writing? BM: I've been writing for pretty much forever. I wrote my first "book" when I was seven. My elementary school had a "young author" competition, and the winners got to read their work around a table in the library, and participate in a little reception. I think I wrote my first novel in middle school. It's eternally trunked though! KL: Haha I know what you mean. I have some writing that I'm holding on to in case I ever write a character that's a 12-year-old aspiring writer. There's something so genuine and earnest about our young ramblings that can't be made up. BM: Absolutely! I don't think I'll ever be as enthusiastic and bright-eyed as I was then. KL: Like, un-self-conscious about the ideas. BM: Yes, and passionate! Much less self-doubt. KL: Exactly! I think these are sort of universal writer themes. I'm not sure if I've met another writer who decided to pursue writing as a twenty-something. It's crazy that there are so many of us that have been working at this for so long, and there's still that lingering feeling of impostor syndrome. BM: Exactly! Impostor syndrome is the worsssst. KL: Do you have any strategies in particular to tackle it? BM: I wish I knew how to dismiss it better. All I've figured out so far is that I can keep it at bay by reminding myself how far I've come, and how proud of me Younger Briana would be. That definitely helps. KL: Yes! And you've accomplished so much! 2 novels, a play, and you work as an editor, too. What are your writing routines usually like? How do you schedule everything? BM: I'm a busy lady! I wish I had more of a routine, to be honest. My only real commitment has been to make sure I write at least an hour a day—and I can't go to bed until I do. I may be somewhat sleep-deprived, but I'm definitely productive! And I use the calendar on my phone and the Reminders app to help me stay on track, because I always have my phone with me and it always beeps to let me know what I need to do. KL: Yes! Oh my gosh I started using Reminders over the summer, and it's completely changed the way I keep track of my work. BM: YES OMG how do you use it? KL: Hahaha I was just about to ask you! BM: haha I beat you to it! KL: I think part of my issue is I always have 4 or 5 different projects rotating in my head all at once--I'm a multi-tasker, but such a big part of drafting a novel is consistency. And building a certain amount of momentum with the ideas. Before, I'd have notebooks and post-its and material gathered in a giant Scrivener doc. But it was just too scattered. BM: Oh yeah, I get that. KL: I looked down at my phone one day--I think I was setting a reminder for Trader Joe's--and I was like, wow, the answer is here right in front of me. Basically, any time I get any sort of idea, I'll put it in Reminders with a sort of short hand code before the note itself. Like I'll say "Patreon: writing lessons I've learned" or "WTLGO: Nikki backstory inconsistent with present day character." Then when I sit down to write, I'll start by reviewing any notes or prompts from my Reminders. BM: I like the shorthand! I may have to steal that. KL: Ok your turn--how did you come about using Reminders? How do you use it? BM: I just use it for its intended function. I put tasks in there and set notifications as needed. And I make sure the badge icon is on, because that nags me to actually check it and take care of my incomplete tasks. KL: It's funny how we sort of have to set traps for ourselves. KL: Ahh yes I do something similar. Do you ever feel like music and writing kind of work in tandem as you work? BM: Oh yes! Each novel has a specific mood and atmosphere, as does the respective playlist so I totally agree with that. Pinterest helps a lot too. KL: Do you do establish these mood boards/playlists as part of your pre-write process? Or is it more something you do as you're writing? BM: A little bit of both! I usually create them as I'm brainstorming and outlining and then add to them as I go. KL: So you're more of a plotter than a pantser? KL: Yuuuuup that sounds so familiar. BM: Yes!! 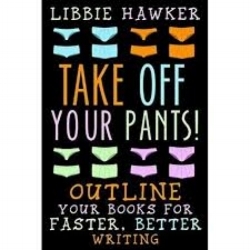 Have you read Take Off Your Pants? KL: Haha no! That title is amazing!! BM: This book changed my life omg I HIGHLY recommend it. KL: Since we're on the topic of pre-writing and outlining, what was your process like for writing Touch? And how has the playwriting process influenced your novel writing? BM: I came up with a VERY loose outline for TOUCH, really more bullet points of major events. I filled in the gaps as I wrote, but otherwise I didn't do too much work before. That was a couple years ago, so my process has changed a lot. And writing plays makes it easy for me to picture the scenes from my books in my head, and I think that in turn makes it feel more real to me. KL: Totally makes sense. I tend to take a more interdisciplinary approach to writing. I get as much out of watching movies/TV, seeing plays, or reading comics as I do reading novels. BM: Oh yes, wholeheartedly agree. I get more inspired by other people's works than I do my own though. No matter what medium or genre they're in. KL: Touch has such a beautiful message and is expressed so elegantly as a one act--what inspired it? BM: I was living alone in Florida when I wrote it. I had no family or friends around, and I was profoundly lonely. All I was doing was going to work and coming home each day, without much interacting with anyone. One day I realized no one had touched me in several weeks, and that realization stuck with me. Touch was born out of that realization. KL: That's amazing--the concept and feeling really comes through in the play. KL: So, I think that just about wraps up my questions. Thanks for taking the time to talk, Briana! This has been so much fun! BM: Thank you so much, Katie! Learn more about Briana Morgan on her website. Follow her on Twitter, Tumblr, Facebook, Pinterest, Instagram, and Goodreads.